There are few joys in life as exquisite as expertly prepared food that has been cooked over fire in the great outdoors. Some of us get so excited for grilling season that we start scrubbing the grill and stocking up on charcoal, wood chips, or propane at the first sign of warmer weather. Others still grill, rotisserie, or smoke year round, regardless of the climate or season. However, a passion for grilled food is only the beginning: a true Grill Master must learn and develop the proper grilling techniques to grill any meal in any style. 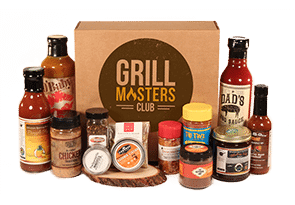 To aid you on your quest to become a true Grill Master, we have assembled this guide to raise your grill game to a whole new level. 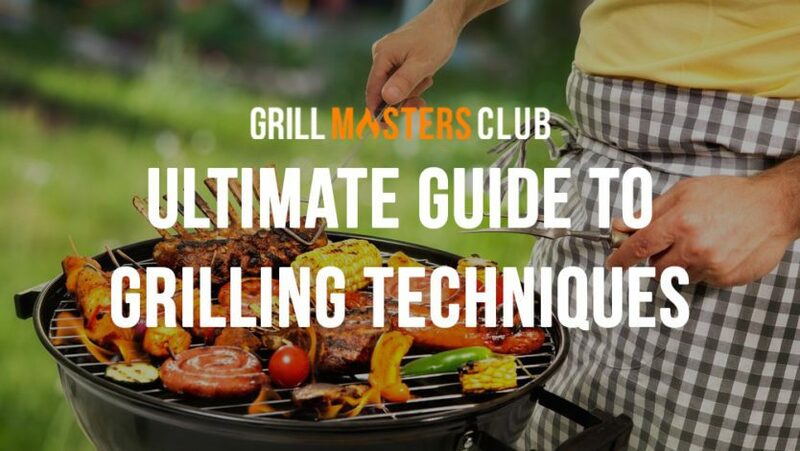 Get that charcoal going, soak those wood chips, and get your grilling machines in good working order, because it’s time to learn the ways of the Ultimate Grill Master. -Start by opening the lid and bowl vents all the way. -As with direct grilling, begin by opening the lid and bowl vents all the way. -Pour a little water into a drip tray and carefully set it between the arrangement of hot briquettes. -Lower the cooking grate back into place and set your food above the drip tray in the center of the grate. -Pop the lid back on and wait for your food to cook for its allotted amount of time. -Monitor the temperature as your food is cooking. If it starts to get too hot you should trim the airflow by closing the vents a bit. -Get your bowl and lid vents open to optimize the airflow. -Put all your briquettes on one side of the charcoal grate. -Put some water in a drip pan on the other side of the grate. -Place the cooking grate, then sear your meat quickly over direct heat from the coals. Be sure to sear both sides. -Once you have seared both sides of your meat, it can also be slid over to the drip pan side to finish cooking. -Put any other food that needs to be cooked more slowly over the drip pan. Voila! You have learned the three techniques to master for charcoal grilling. The type of technique you choose largely depends on what you are attempting to cook, but knowing how to implement all three grilling techniques allows you to vary your cookout menu over the course of the grilling season. The techniques for using a gas grill for direct, indirect, and modified or 50/50 grilling are pretty much the same as for charcoal grilling, but rather than spreading your charcoal briquettes, you turn your gas burners on or off depending on which of the three methods you are employing. Here’s a quick rundown. The advantages of the gas grill over the charcoal grill is that it takes less time to heat up, the temperature remains more constant, and it is easier to maintain a constant temperature. The downside is mainly in flavor but the debate of which is overall better is a fierce one. -Fire up all the jets/burners and max out the heat. -Preheat for about 5-10 minutes with the lid closed. -Throw your food on the cooking grate directly above the burners. -Flip and remove as needed. -Preheat for 5-10 minutes with the lid closed. -Shut off the middle burner and arrange food over the unlit burner. -With just one burner on full blast, sear your food to lock in the flavor. -Slide seared food over to the unlit side to finish cooking slowly. Gas grills are better for quick meals cooked up outdoors, but they lack the flavor of the slower preparing and more work intensive charcoal grills. You can buy flavor-enhancing briquettes for your gas grill to give it a smokier flavor, but many grillers feel that the flavor a charcoal grill provides makes it worth the extra effort. As with all grilling techniques, how you grill is always entirely up to you. -Slowly rotating meat on a spit makes it brown and caramelize evenly over the entire surface. 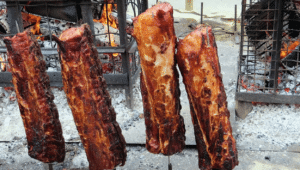 -Spit roasting allows meat and poultry to self-baste as their melting fat and juices are recirculated through the meat over and over as they roast over the flames. -Spitroasting can be done over charcoal, gas, wood, on a campfire, or even in a fireplace. Start by prepping your meat for the rotisserie in such a way that it is as cylindrical as possible. Poultry should be trussed, roasts should be tied, and legs of whole animals should be bound with string or twine. The floppier the load on the spit, the more unbalanced and uneven the cooking will be. As you start loading the spit, begin by putting one fork on with the prongs facing the center of the spit. Thread the food on the spit through the center, then insert the other fork into the spit to secure your food. Make certain that the weight of the food is centered and balanced properly on the spit. Ensure everything is balanced and rotates properly before tightening the screws on the prongs for the spit. When roasting over charcoal, use the indirect heat method, and place a drip pan directly beneath the spit. Attach the end of the spit to your motor socket, making any necessary adjustments to the load and counterweight so that the food spins evenly. Be sure to add fresh coals every hour as needed. For campfire spitroasting (this is prohibited in some areas, so check your local laws and regulations), rake your embers into a rectangle that lies just behind the rotational axis of the spit. Place a drip pan underneath where your food will be cooked, and add more coals as needed during cooking. Rotisserie cooking of meat is extremely popular for South American style meats, especially in Brazil. If you decide to give spit roasting a try, Brazilian rubs, sauces, and marinades are all an excellent way to add a touch of the exotic to your next cookout. You can also easily acquire what you need online, and there are even kits that allow you to adapt existing charcoal or gas grills for spit roasting as well. Smoking meat, fish, and other dishes is an excellent way to both preserve food for storage and give it a deeper, smokier flavor that you cannot achieve any other way. This is definitely among the most time consuming method of cooking meat outdoors, but the flavors and tenderness of what you prepare is beyond compare. Nothing else tastes like smoke roasted food, and it is well worth the extra effort it takes to prepare. In terms of flavors, you will need to decide what flavor you are looking for when choosing wood chips/chunks. -Inspect the interior of your smoker to verify that both the insides and the water pan are clean. -Set your charcoal grate in place in the bottom of the smoker. -On cold days, load two chimney starters filled with briquettes on the top of the coal grate and ignite them using firelighters. On warmer or hot days, a chimney and a half should more than suffice. -Be sure to wear gloves when handling chimney starters. -After the coals are burning and greying on the top, carefully pour them into the charcoal chamber and spread them evenly. Briquettes in a smoker will typically last up to 8 hours. -Set the water pan and cooking grate in place, then slowly pour a gallon of water through the cooking grate into the water pan. -Ensure that all vents are open, and wait for the thermometer to read between 200 -250 degress Fahrenheit before putting any food on the grill. -When you are ready to load food into the smoker, you can place food on both the lower middle grate and the upper grate. Keep in mind that the top grate usually cooks at around 15-20 degrees hotter than the lower grate. -Open the charcoal grate access door and add your wood chunks/chips to the hot coals. You should only need 4-6 chunks or 2-3 handfuls of chips to last an entire cooking cycle. -Place the lid on your smoker and keep an eye on the temperature for at least half an hour to make sure it doesn’t get too hot or too cool. -During the first hour of smoke roasting, you need to check the temperature every 15 minutes in order to keep it in the ideal “smoke zone” of 200-250 degrees Fahrenheit. Opening the bottom vents increases temperatures, whereas closing them causes temperature to drop as the smoldering coals begin to become starved of oxygen. -Add water about every two hours as necessary. Add boiling water to maintain your roasting temperature. Be careful not to overfill the water pan, as spilled water will create and ash cloud that will sour your food. -Keep the lid on the smoker as much as possible. Every time you open the lid, flavor is lost and cook time increases. You should only remove the lid if foiling, basting, or removing the meat for carving. Furthermore, you should turn meat only once during cooking to ensure the best possible flavor. These are the grilling techniques that will make you the undisputed king (or queen) of the cookout. Neighbors and friends will be rearranging their social calendars to attend your outdoor meals, and the better your technique, the more refined and exceptional your grilling will become. 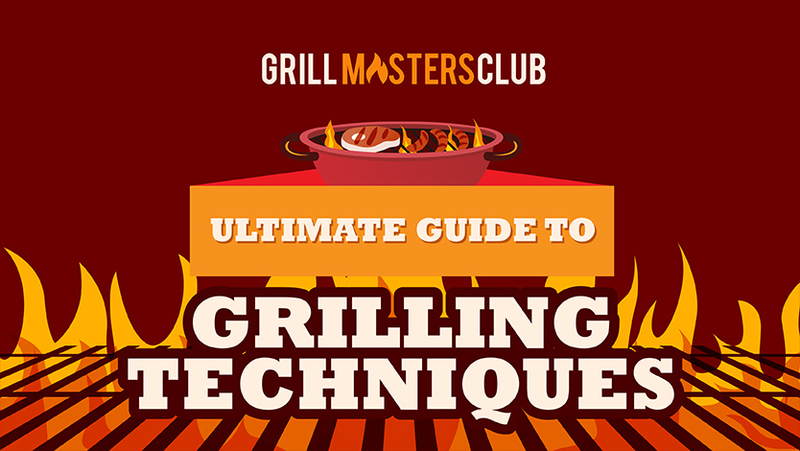 Learn to master these methods of grill magic, and ascend to your rightful place as Grand Grillmaster in Residence for your circle of friends, family, or neighborhood. Share with us your grilling techniques on Twitter, Facebook or Instagram.